All transactions are safe and secure with a reliable history in online purchasing behind each of our associates. 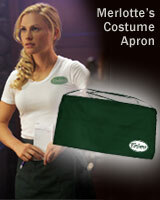 Buy the Sookie Stackhouse Costume Apron to own True Blood clothing and merchandise. Serve up drinks at your next Halloween party in this Merlotte's Sookie costume apron. Everyone will think that you just finished your shift working for Sam Merlotte, your employer and longtime admirer. This green True Blood apron is the perfect complement to the white Merlotte's shirt that is also available. Get them both to complete your Sookie waitress outfit, the perfect Sookie Halloween costume. Just try not to read the minds of too many of your friends. In addition to the Sookie Stackhouse Costume Apron above, browse the True Blood Clothing Gallery for more apparel like men's and women's clothes, kids shirts or hoodies.